STOP IT!! YOU ARE MAKING ME MAD! WHY ARE YOU BEING SUCH A JERK?! GIVE IT BACK RIGHT NOW, OR ELSE! As a parent, it's hard to listen to your kids fight. It's even harder when they fight with words and phrases that you know they learned from you. It hurts to listen to. It makes me feel horrible. And it's a wake up call. Don't get me wrong. My kids get lots of wonderful things from me too: their zany sense of humor, their generosity, their good looks. There are many days when I am exceptionally proud of them and I want to take credit for all the good they do in the world. Then there are days that things go wrong. We get off track and things start to spiral out of control. I yell. They yell. Everybody yells. The things they say; the tone of their voices; the looks on their faces: it's like a mirror sometimes. I'm looking at myself and I hate what I see. They reflect me so perfectly and I am ashamed at what I've taught them. If I take credit for the good, sweet things, then it's only fair to take responsibility for the bad, right? Parenting changes you in a lot of ways. It gives you hope for the future and fills your heart with love. It also challenges you to be a better person. Especially when your deficits are so glaringly obvious. I'm not throwing a pity party. I know I'm not a bad mom. However, I also know that I have lots of less-than-stellar mom moments. I'm learning that how I handle myself after a blow up is one more thing they are watching. I'm reminding myself to apologize to them when I've been wrong or acted badly. I'm talking to them about tempers and actions and how we should treat other people. I've got one kid who is brave enough to call me out when I'm being a hypocrite. And that is more humbling than I ever imagined. It's also a great teachable moment. 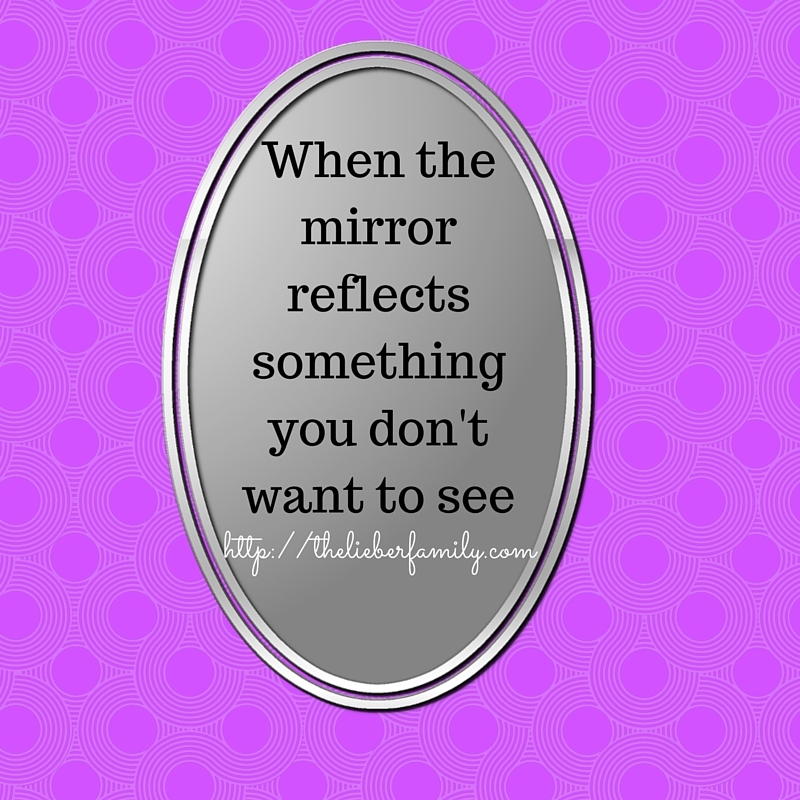 Because the reason he can call me out is because he sees the mirror. He's got that much figured out early. This morning he got mad at me when I was trying to help him get ready for school. They've got themed Fridays and I thought today was "cowboy day." He knew it wasn't, but he didn't know what day it actually was. "You're just making it worse!" he yelled. "I'm just trying to help!" I yelled back. And then we went to our separate corners for a minute. "You are being rude to me when I am just trying to help you get ready." I said more calmly. He waits. He gets dressed (in a shirt with words for "read my shirt day.") He goes to the bathroom. He comes to my room. "I'm sorry I was rude to you this morning." His contrite little face tells me he really is sorry. And it tells me that he wants to fix things. "Thank you for apologizing." And then a hug. Because we both needed one. And now we can both go on with our day in a much more peaceful manner. The thing about mirrors is that they show us an accurate reflection of ourselves. And if what we see doesn't make us proud, then it's up to us to change it. My mirrors will go out into the world on their own some day. The things they do will be a reflection of me and I want it to be a good one. Your hosts: Kristi, at FindingNine.com and this week’s sentence thinker-upper, April of April Noelle.